by Hilton Hater at May 19, 2018 10:07 am . The former Suits actress and the son of Princess Diana said "I Do" in front of hundreds of guests in attendance at St. George's, not to mention thousands lining the street outside and millions watching at home. But we're not here right now to talk about those two romantic words. The subjects in this case are the two Royal Brides from the past decade, Kate Middleton and Mrs. Markle. The former, of course, tied the knot with Prince William back in 2011 in an event whose anticipation we never thought could be topped until today. At the time, the Duchess of Cambridge wore a lovely lace Alexander McQueen gown designed by Sarah Burton, the fashion house's creative director. The now-legendary gown featured long lace sleeves, a v-neckline and an extremely long train. 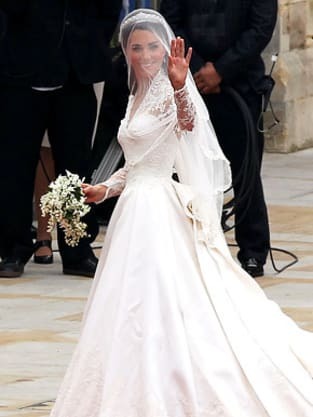 Kate’s dress was also composed of French Chantilly lace and English Cluny lace throughout the bodice, skirt and underskirt. 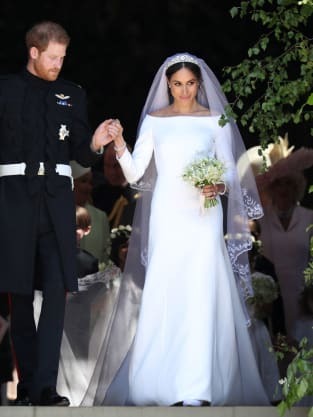 Markle, meanwhile, went with Givenchy. She donned an ensemble by the fashion house's creative director Clare Waight Keller. It featured a boat neckline bodice, long sleeves and a sheer cascading veil adorned with lace trim. The delicate veil was actually made from silk tulle and it included a trim of hand-embroidered flowers in silk threads and organza. Both women looked gorgeous. Stunning. Beautiful in every way possible. But let's be honest now: While the world is standing up and applauding Meghan and Harry on their big day and wishing them the very best of luck, they're also engaged in a different kind of debate. Who wore her Royal Wedding Dress best, Middleton or Markle? It's worth noting that Middleton's dress grew to be so iconic and so memorable that H&M designed a similar version that retails for the affordable price of $299. Will Markle's gown create such demand? Will designers be lining up to essentially copy it and offer it at a discount to the masses? It's far too early to say. Prince William and Prince Harry are both very lucky men. They married stunning women with terrific fashion taste. Everyone here is a winner in the broad sense of the word... but only one of these brides can be a winner in the specific sense of this post. So we ask again: Which Royal Wedding Dress do you like best?